What size does the garden arch need to be? It’s not only the height and width of the arch, but most importantly the depth that’s important. That is, the distance from the front to the back of your arch as this is what your plant will be growing over. Oddly enough this is the last thing most people consider. How wide should my arch be? If you’ve already got a path in situ, the arch should be placed at least 15cm away from the edge. Your foliage will penetrate into the inside of the arch so you don’t want to be rubbing up against it as you walk through – especially if it’s a thorny rose or boganvillea. Will you be pushing a wheelbarrow through? If so you might want to make it about 1.5m wide just in case your barrow is overflowing – there’s nothing worse than losing half the barrrow of weeds and prunings as you walk through your arch way. How deep should my arch be? The depth of the arch, from the front to the back, is the most important factor for your plant. 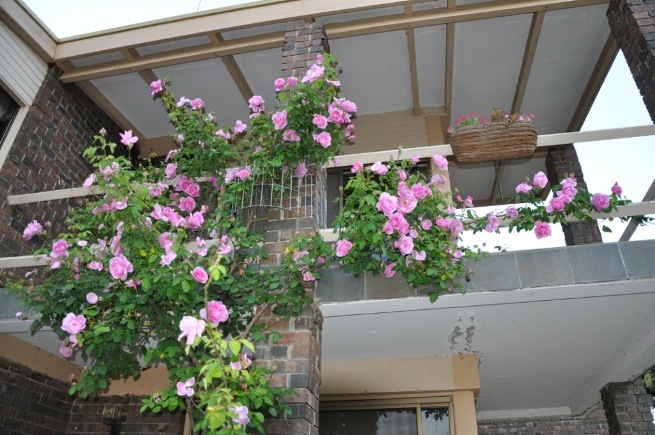 Most people will take into consideration the height, as naturally climbers will grow upwards, however plants like roses will grow and bloom best if the canes run horizontally or diagonally. The key to growing climbing roses successfully is to encourage the growth of side shoots which give you more flowers. The way to do this is to train the main canes horizontally because this will encourage side shoots to grow, as can be seen in the photo above. As the shoots grow twist them back and forth to give you lots of horizontal growth. There’s an excellent description here on how to do this. all varying in size so make sure you choose an appropriate plant and/or rose arch. 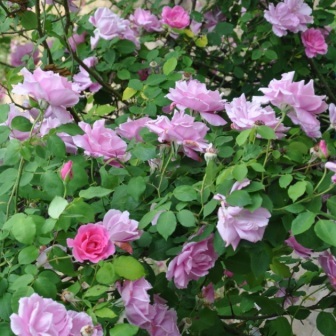 As you can see from the photo below a climbing rose such as ‘Mrs Fred Danks’ would be unsuitable for an arch. These canes are about 6-8m tall. How are you going to fix it to the ground? Don’t rely on your plant anchoring the arch to the ground. If anything, a well covered garden arbour will catch the wind and may blow over in a gale with disastrous results. The legs of the rose arch can be left a bit longer so they can be concreted into the ground. We can allow about 30-40cms at no extra charge. Alternatively if there’s paving or concrete on the ground, then a plate can be welded on so that you can bolt it to the ground. 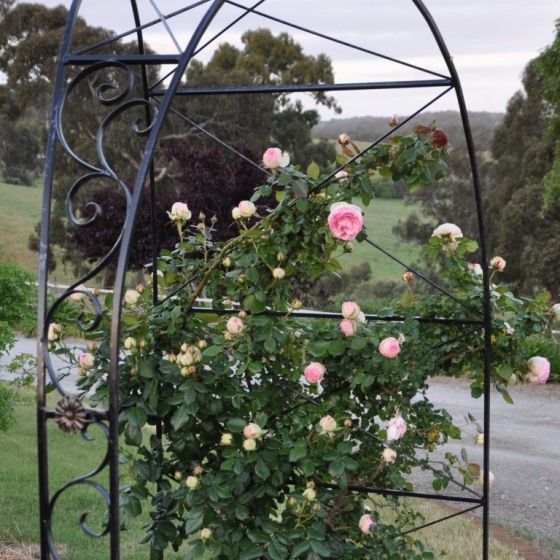 Do you want your rose arch powder coated or left galvanised? If part of your arch is going to be left exposed then you may want to consider whether you want to have your arch powder coated or left as is. Powder coating is not cheap and if the majority of the arch is going to be covered with foliage then it may not warrant the additional expense. However if the arch is going to be a feature in itself, then it definitely would look nice powder coated to your choice of colour. We don’t recommend that you paint the arch as you’ll have to recoat it within 5 years, especially if you’re painting over galvanised pipe as short of using heavy duty primers and industrial paints, the paint won’t adhere to galvanising terribly well. Keep in mind that repainting an arch isn’t easy once there’s foliage over it. Powder coating on the other hand should look good for at least 10 years – so if you want it coloured it’s money well spent. I hope this article helps you with selecting the right sized rose arch for your garden. 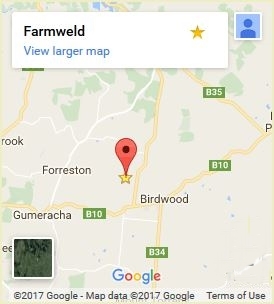 To see the range of Farmweld’s garden arch designs click here. Looking for a garden arch? Click to view Farmweld’s range of garden arches.